Street parking and pay lots are available. Free street parking during the week until 6pm directly in front of the restaurant and along the sides of Commerce St and a few others in the Deep Ellum area. Read the meters. Pay lot behind Cane Rosso is managed by ParkMobile app. DART train is 1 block away. Dog friendly patio. Leash required at all times. 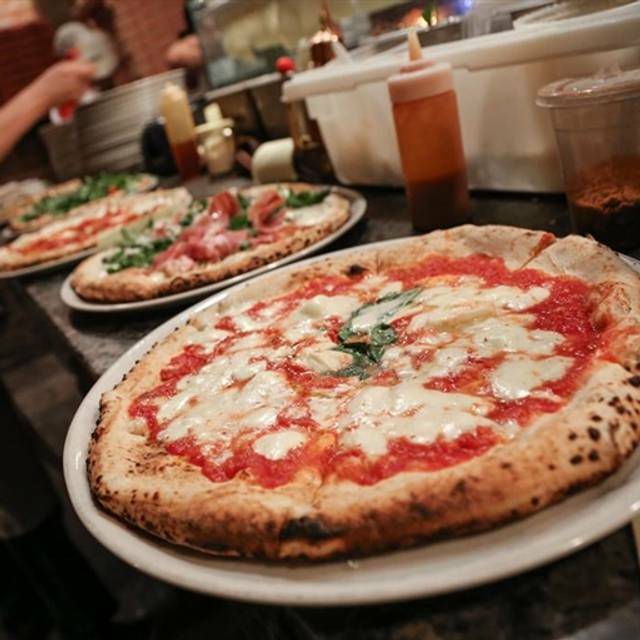 You can watch our Pizzaiolos work their magic on our wood-fired oven! Please contact the restaurant directly or email dfwevents@canerosso.com for more information. 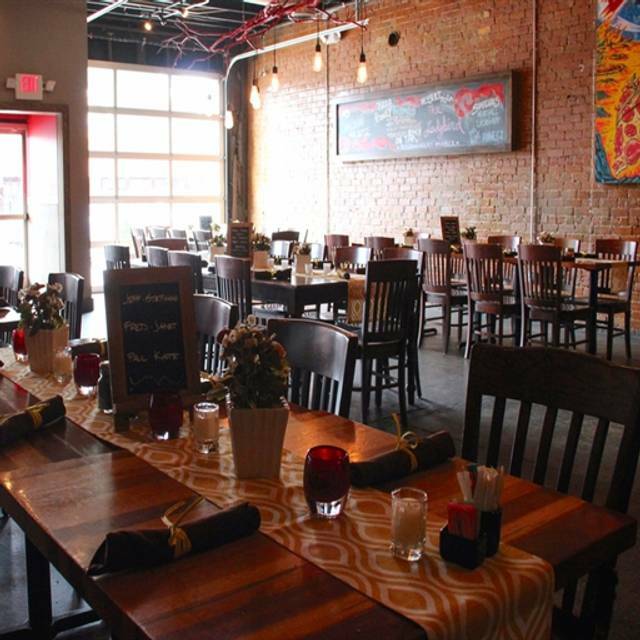 PLEASE GO TO https://canerosso.tripleseat.com/party_request/3042 TO INQUIRE ABOUT OFF-SITE CATERING FOR YOUR NEXT EVENT!! From its beginning as a mobile pizza operation to multiple locations across the DFW metroplex, Houston and Austin, TX, Cane Rosso restaurants continue to evolve and make bellies happy! From handmade dough and mozzarella made in-house daily for our wood-fired Neapolitan pizzas to fresh pasta, authentic Italian desserts, wines, cocktails, local brews, and unique takes on classic, traditional Italian dishes, everyone is sure to find something they like! Every Cane Rosso restaurant partners with local vendors, brewers and restaurant suppliers to help support its local community. We hope you will join us for a dining experience you are sure to enjoy! Cheers! Easter lunch with the family. Excellent pizza! Best brussels and pizza I’ve had in years. Always good, flavorful and quality food. We were there for a late birthday lunch so it wasn’t super crowded. Made for a better, more intimate experience. Awesome place and great food. Service was perfect! The brunch menu has changed a bit since last time, the chicken and waffles were amazing! and the mimosas are only $2! I've always had a good experience at this restaurant. The location was amazing and easy to get to, the environment was fun and friendly, everyone I dealt with was very polite, and the food was AMAZING. I can not recommend this place highly enough. Everything was so amazing. I can’t wait to go back. Fantastic food, service, and atmosphere. Pricey but absolutely worth it. Recommended by a Dallas friend - did not disappoint. We went at 5PM opening, so no crowds. Great service, tasty pizza, decent assortment of cold beer. Service was terrible. Waited 10 min. before our waiter arrived. Got our order wrong. Had to go to the bar to pay the tab. Not as good as expected after reading all the reviews. Pizzas are OK, as good as any other pizzeria. Would recommend to friends but with limitations. Really poor service. I chose this place because it had good ratings, but I was blown away how badly the service was. It took 20 minutes to even order drinks once we sat down. With a party of 8 all of our food came out at different times, I received my food almost 30 minutes after everyone else and it was a pizza that they advertise on their menu that takes 90 seconds..... Manager made up for it with free desert, but I will not be returning or recommending. I made a reservation for 8 o’clock and walked in with our party just before that time. Hostess was ready to seat us and the service was excellent. The food was delicious and a great value for our money. We were celebrating our daughter‘s 15th birthday with her friends. Admittedly, we came for the brunch as described online and we were a bit disappointed when the menu had 2 offerings. However- we decided to have lunch and the pizza was amazing! Fresh toppings, great crust, good save! Great place, great people, great food!!! Went here for lunch and it was great. Definitely in the top tier of best pizza I’ve ever had. Would highly recommend if you’re in deep elm and in the mood for some pizza. 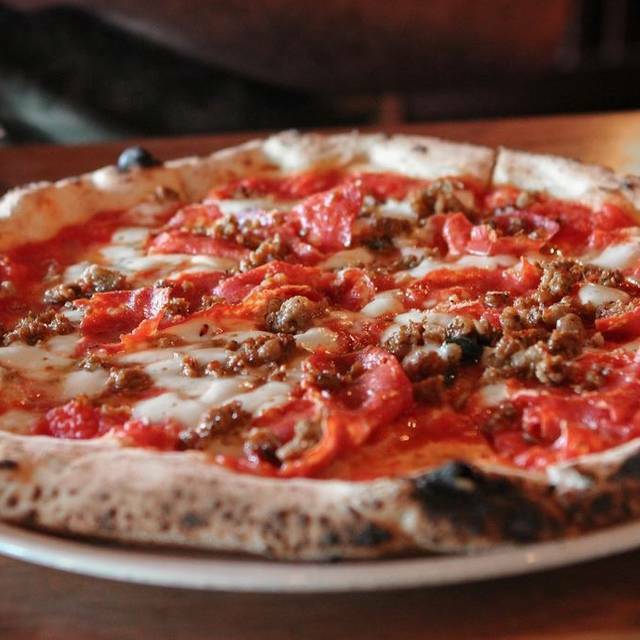 The authentic Neapolitan style pizza never disappoints. Our family each has a favorite...margherita, Emma, Che Casso, s’more calzone. Service was quick! Was good. We just got a table that was not great. Food was excellent. The specialty pizza (not on the menu) was "Ahhhh-mazing!" Sweet & spicy with just the right mix of both! Casual atmosphere was relaxing, although the seating was not all that comfortable on the non-booth side of the small table. Service was exceptional and prices are quite reasonable. We enjoyed our lunch and will definitely return. Held a great birthday party at Cane Rossa. Table was ready on time and food and service was exceptional. What a great place! The happy hour is awesome, can’t wait to go back! Great food but it was wife's Birthday which I put on my reservation and my daughter mentioned it to the waitress, and they did not do anything special. We even got 2 desserts so they had 2 chances to do something, disappointed! We went there for lunch, and were not disappointed. Excellent choices, and the service was outstanding. We are loyal Canne Rosso customers! Each location is fantastic! Wonderful food as always! And interesting new pizzas to try! No one came by our table for 15 to 20 minutes after we sat down. we went with another couple prior to a concert at the Bomb Factory. Service was efficient, friendly, and cordial with good education about the offerings. Pizzas were super tasty and yummy! Very cool place with excellent pizzas. I'm from NY and we are known for pizza. This pizza was OUT OF THIS WORLD! Such a great spot, great food and great ambience. Can't wait to go back to Dallas and head straight to Cane Rosso! Not romantic but did not expect it to be. Very Bohemia which was fun. One of the greatest pizzas in DFW, fab dough. Our waitress was amazing, very attentive. The pizza was really good as well I will definitely return. Always a great place to eat before a concert or theater in the Arts District!